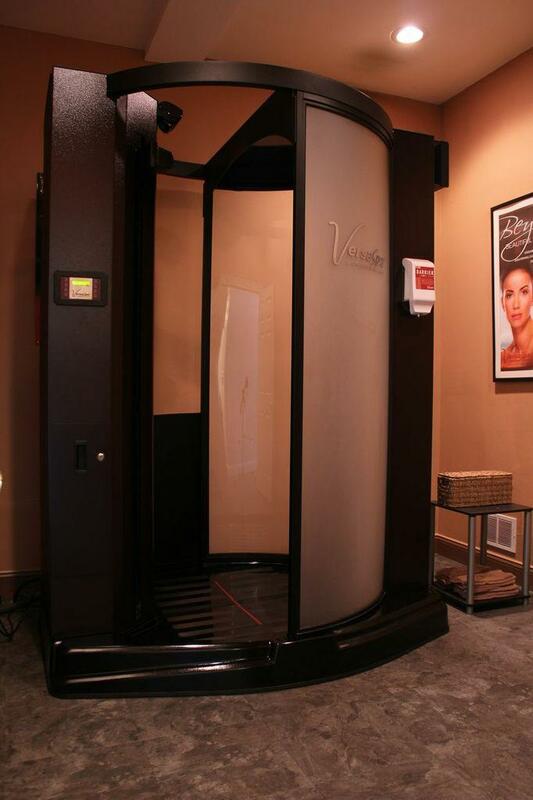 WHY CHOOSE THE VERSASPA AUTOMATIC SPRAY BOOTH WITH NORVELL SOLUTION FOR YOUR SPRAY TAN? Robotic, hand-held simulated dual spray arm for more precise application. Automated voice commands guide clients through four easy positions. Simply face front, right side, left side, then face back. Uses technology for a fog-free spray session with extremely limited inhalation of overspray. The VersaSpa’s open-air technology is designed to work with gravity, pulling over spray downward, limiting over-exposure to inhalation of sprayed solutions. Studies by the European Commission Scientific Committee on Consumer Safety have shown that limited inhalation of sunless spray solutions should cause no concern. If you are concerned, ask your salon for nose filters. Up to 24 hours before your session, we recommend using a mild body polish such as Norvell’s Renewing Sunless Exfoliator. Any heavy exfoliation or oily scrubs should not be used 24 – 48 hours before your session. No. DHA does not build melanin in the skin as a sun tan does. DHA works with the amino acids and body oils found in the outer layer of skin to turn them tan. It is important to use an SPF when going outside to protect the skin from the sun’s rays. All Norvell Sunless Spray Solutions are designed with special fragrances containing Odor Encapsulation Molecules that ‘trap’ and minimize common sunless smell. WHAT IS THE DIFFERENCE BETWEEN ‘BRONZER’ AND ‘NO BRONZER/CLEAR’ SPRAYS? BRONZER: Temporary cosmetic bronzers provide an immediate tan color while you’re DHA sunless tan is developing. Your actual sunless tan will darken over the next 24 hours. You will see the temporary cosmetic color washing off your body during the first shower. This is completely normal. Your actual developed sunless tan will not wash away though it may appear slightly lighter in color after cosmetic bronzers are removed from the skin. CLEAR OR ‘NO BRONZER’: Though you will not see any immediate cosmetic color, your sunless tan will begin to darken within 1 – 2 hours and will continue to do so up to 24 hours. On average your tan should last up to 5 – 7 days. There are many factors that determine this length including how you prepare your skin and care for your skin after your tan. For your first shower, we recommend a warm (not hot) water rinse only – no soap. You may shower as soon as four hours; however, for best results we recommend waiting 8 – 24 hours. Showering prematurely may result in a lighter tan. The active sunless ingredient, DHA, continues to work with your skin for up to 24 hours. Waiting longer will give you a deeper longer lasting sunless tan.